Part 1 Risks: Range of microbial risks in food processing; Biofilm risks; Pathogen resistance to sanitisers; Aerosols as a contamination risk; Consumer perceptions of risks from food. Part 2 Improving design: Improving building design; Improving zoning within food processing plants; Improving the design of floors; Improving design of walls; Improving the hygienic design of closed equipment, heating equipment, equipment handling dry materials, packaging equipment, electrical equipment, valves, pipes, pumps, sensors. Part 3 Improving hygiene management and methods: Risk assessment in hygiene management; Good Manufacturing Practice (GMP) in the food industry; The use of Standard Operating Procedures (SOPs); Managing risks from allergenic residues; Managing contamination risks from food packaging materials; Improving hygiene in food transportation; Improving control of insects in food processing; Improving cleaning in place (CIP); Improving cleaning out of place (COP); Improving cleaning of heat exchangers; Improving cleaning of tanks; Ozone decontamination in hygiene management; Enzymatic cleaning in food processing; Contamination routes and analysis in food processing environments; Testing surface cleanability in food processing; Improving the monitoring of fouling, cleaning and disinfection in closed process plant; Improving surface sampling and detection of contamination; Improving air sampling; Testing effectiveness of disinfectants and sanitisers; Traceability of disinfectants and sanitisers; Improving hygiene auditing. Developments such as the demand for minimally-processed foods have placed a renewed emphasis on good hygienic practices in the food industry. As a result there has been a wealth of new research in this area. 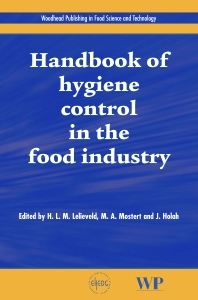 Complementing Woodhead’s best-selling Hygiene in the food industry, which reviews current best practice in hygienic design and operation, Handbook of hygiene control in the food industry provides a comprehensive summary of the key trends and issues in food hygiene research. Developments go fast: results of the R&D meanwhile have been applied or are being implemented as this book goes to print. Part one reviews research on the range of contamination risks faced by food processors. Building on this foundation, Part two discusses current trends in the design both of buildings and types of food processing equipment, from heating and packaging equipment to valves, pipes and sensors. Key issues in effective hygiene management are then covered in part three, from risk analysis, good manufacturing practice and standard operating procedures (SOPs) to improving cleaning and decontamination techniques. The final part of the book reviews developments in ways of monitoring the effectiveness of hygiene operations, from testing surface cleanability to sampling techniques and hygiene auditing. Like Hygiene in the food industry, this book is a standard reference for the food industry in ensuring the highest standards of hygiene in food production. Tineke Mostert works in these filelds at the Unilever R&D Centre in Vlaardingen, The Netherlands and has been chair of EHEDG’s Packaging Group.